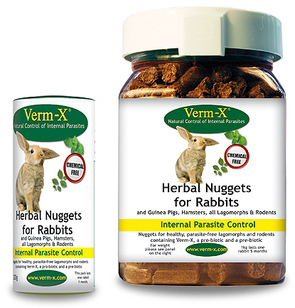 Verm-X Nuggets for Rabbits, Guinea Pigs, Hamsters, all Rodents and Ferrets have been carefully formulated and produced to give domestically-kept lagomorphs, rodents and mustelidae not only the highly palatable Verm-X internal parasite control formulation but also an overall high fibre healthy treat. Verm-X Nuggets for Rabbits, Guinea Pigs, Hamsters, all Rodents and Ferrets have been carefully formulated and produced to give domestically-kept lagomorphs, rodents and mustelidae not only the highly palatable Verm-X internal parasite control formulation but also an overall high fibre healthy treat. Verm-X Herbal Rabbit Nugget Verm-X Nuggets for Rabbits, Guinea Pigs, Hamsters, all Rodents and Ferrets have been carefully formulated and produced to give domestically-kept lagomorphs, rodents and mustelidae not only the highly palatable Verm-X internal parasite control formulation but also an overall high fibre healthy treat. The nuggets include alfalfa, wheat and molasses, a Pre-biotic (Biomos: dead yeast of saccharomyces cerevisiae) and a Pro-biotic (Toyocerin) that encourage a healthy digestive system. They are designed to be gnawed, bringing the additional benefit of aiding healthy and strong teeth. Ingredients include: Verm-X, alfalfa, wheat, molasses, pre-biotic (saccharomyees cerevisiae), pro-biotic (toyocerin), soya oil. Product analysis: Oil 3%, Protein 13.5%, Fibre 17.5% and Ash 9.5%.